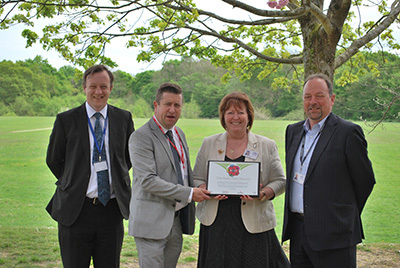 This week has seen the official handing over of Chailey School’s ‘Peace Field’ plaque by Ernie Brennan, Managing Director of the National Children’s Football Alliance. Two years ago, the school took an enthusiastic lead in the national and international ‘Peace Field Project’ which called upon schools to dedicate playing fields to peace in commemoration of the Christmas Truces on the Western Front in 1914. This moment of history that inspired humanitarianism, rather than bloodshed and conflict, is the historical focal point of the project. Since 2014 and also as part of their own ‘Chailey and The Great War’ project, the school has organised annual football tournaments for local primary schools on the field, attended by representatives of the NCFA and also The Royal British Legion. At the last of these events, Mr Brennan presented a ‘Poppy Ball’, marking this twinning with Flanders Peace Field and the Peace Village at Messines in Belgium (site of the 1914 Christmas Truce). This plaque then marks the next stage, and a copy of the plaque will also be formally handed over in a ceremony at the Peace Village at Messines. Chailey will be the first British School to be represented there in this way, and it is delighted to be at the forefront of such a project. The Peace Fields Project (PFP) provides opportunities of schools to twin their designated areas of play with one of the world’s most famous areas of play, Flanders Peace Field. In 1914 Flanders Field witnessed the First World War’s Christmas Truces where Allied and German soldiers put down their weapons, met in no-mans-land, shuck hands, exchanged gifts and played some football. The historic event has become synonymous with acts of humanitarianism throughout the history of the world. School teachers, sports coaches and educationalists around the world recognise the value of the Christmas Truces in 1914. Commemorating war and celebrating peace, through the PFP lends itself to cross-curricular activities, inter-generational relationships, citzenship, social inclusion and community cohesion. Contextualising the events throughout the First World War helps young people contemplate the realities of war and in the case of the Christmas Truces, the role of sport in the First World War. ‘We are very proud to be the first school in the country to twin our playing field with Flanders Peace Field. Our Peace Field will promote friendship and sportsmanship in the spirit of the Christmas Truces.’ Lesley Young, Head Teacher. L-R. Ernie Brennan, Director, NCFA and Lesley Young, Head Teacher, Chailey School, signing the Peace Field Project Declaration. The PFP Declaration pledges Chailey School’s commitment to peace and promoting fair play. Chailey School’s playing field is forever twinned with Flanders Peace Field, a legacy to the First World War and a modern day memorial to peace. ‘The 100 year commemoration of the First World War gives our school a legacy where all the games played on the peace field will advocate fair play.’ Tim Dudgeon, Assistant Head Teacher. Chailey School’s PFP plaque will be displayed overlooking their peace field. A second plaque with Chailey School’s name on it will be displayed at Flanders overlooking the site of the 1914 Christmas Truces. ‘Chailey School is a forward thinking school. Its commitment to their pupils’ education is clearly witnessed in being the first school in England to twin their playing field with Flanders Peace Field.’ Ernie Brennan, Director, NCFA. ‘Twining Chailey School playing field with Flanders Peace Field will benefit all our pupils, staff and community. The PFP commemorating war and celebrating peace is a poignant way for our pupils to engage in history and their future.’ David Whelpton, Board of Governors, Chailey School.